This tip multiple queries in report explains how to add many queries to the one report. These queries could be quite unrelated, but you wish to present the results for each of these queies in the one report. There are many occassions, where this maybe required and it can result in a very professional and comprehensive report. Create your queries. As mentioned above, they can all be unrelated. Create a new report which is not bound to an underlying table or query. Then select 'Report Design', this will open a new unbound report. Once you have created your new unbound report, you will then add each or your queries to the report. On your Ribbon, click on the 'Design' tab, if not already selected. Select, the Subform/Subreport from the 'Controls' tab, you will need to click on the drop down arrow to see it. Follow the wizard, choosing your first query, and the fields you wish to have displayed. Change the name of the subreport, to a sensible name. Click on 'Finish' when done. Your subreport will be created. 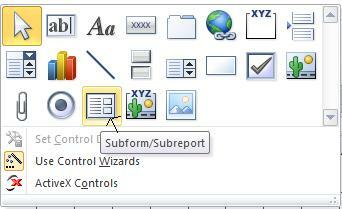 Note: By following the wizard and choosing your query, your subreport will be displayed as a continuous form. If you are not happy with the format that this process provides you with, then you may prefer to set up your subreports first, then add the subreports to your main report. You would still follow the steps above but would choose the previously created subreport(s), rather than the query(ies). Repeat for each of your queries/subreports, to end up with multiple queries in report.